Beat the egg whites with the salt until stiff, add half of the sugar and continue to beat until the mixture turns glossy. Add the remaining sugar, lemon zest and 1 tsp of lemon juice, continue to beat until the mixture is fine-textured, glossy and very stiff. Spread the mixture into a circle on a baking tray lined with baking paper (approx. 20 cm in diameter), pull the edge upwards slightly with a spatula. Bake for approx. 20 mins. in the lower half of an oven preheated to 150°C. Turn the oven down to 120°C and allow the pavlova to dry for approx. 1 hr. 40 mins. Then turn off the oven and leave the pavlova to cool with the oven door open. Carefully mix the whipped cream into the yoghurt. Puree 2 kiwis with the remainder of the lemon juice. Slice the kiwis. 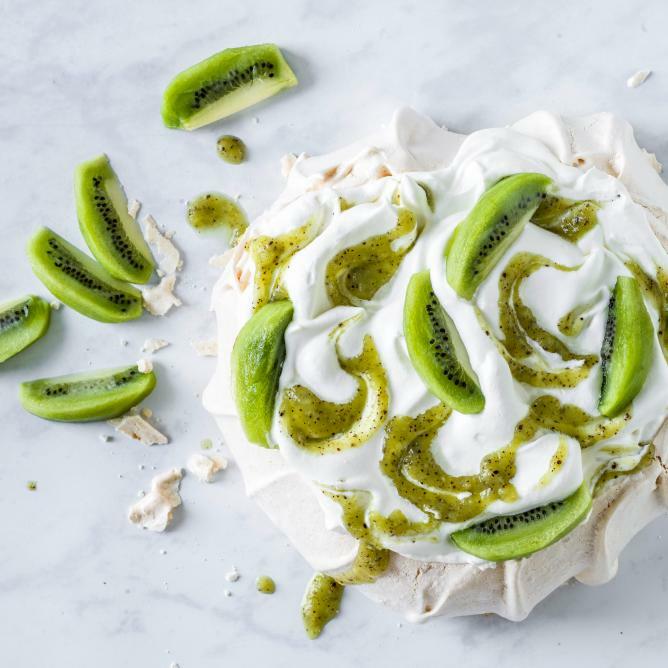 Place the pavlova on a cake plate, top with the yoghurt cream, kiwi puree and kiwis.